Cactus Turn-out and Winter Horse Blankets are now available at J&N Feed and Seed. Now that winter is approaching and the temperature is dropping, horse owners need to consider how to winterize their horses. 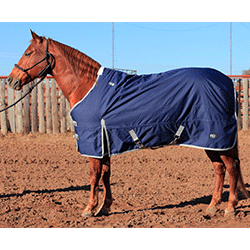 Help protect your animals from the winter elements with horse blankets by Cactus. Our Cactus Gear and Relentless Turn-Out blankets are loaded with features to keep horses warm, dry and comfortable in inclement weather. How to measure for a blanket? Measure from the center of the chest, horizontal around the largest part of shoulder, across the barrel, around largest part of hip to edge of tail. Measurement is size of blanket, round up for odd numbers. During the cold season, horse owners must make sure that their animals receive proper feed, water and shelter to stay healthy and comfortable. Further, since riders usually put a lot of time and effort into getting their horses ready for shows, trail rides, or other events during the warm months, if they maintain their horses over the winter, all that effort won’t go to waste and have to be started over in the spring. Stop by J&N Feed and Seed and shop our selection of horse blankets, feeds and shaving to keep your horse warm and healthy during the winter months. This entry was posted on Thursday, December 1st, 2016 at 2:45 pm	and is filed under News & Updates. You can follow any responses to this entry through the RSS 2.0 feed. Both comments and pings are currently closed.